At Pivotal, our mission is to transform how people build software. Central to that is being great at working with data. Whether managing data, analyzing it or connecting it with applications, the Data Suite contains tools that can help you accelerate your digital transformation. At Pivotal, we feel that open source is key to building great software. Simply put, open source provides the flexibility, transparency, and momentum that can be key to accelerating adoption of a new technology. These deeply held beliefs are why Pivotal Data Suite is based on open source technologies. Your requirements, aspirations and business are going to change over time and our experience is that our licensing model helps you to reduce risk. 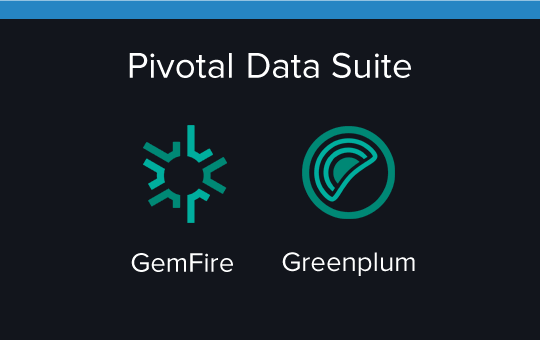 Available in a simple subscription license, Pivotal Data Suite provides you access and support to the commercial offerings of our open source database products. Priced by the core, with Pivotal Data Suite you can mix use of different products in the portfolio as your requirements evolve. Pivotal is a partner for enterprises who want to build the new future. Pivotal Data Suite provides a broad foundation for modern data architectures. It can be deployed on-premise and in public clouds, and contains all the elements for batch and streaming analytics architectures. Each product of Pivotal Data Suite is based on technologies which are collaboratively developed with open source developer communities. Pivotal creates production ready distributions that are available with enterprise class support and bundled extras. Pivotal Data Suite is a one to three year subscription to Pivotal’s portfolio of data products. It is core-based and you choose any size capacity you wish to deploy. Cores can be allocated among products as you wish for the duration of the subscription. Data warehouse system with a scale out architecture, ANSI-compliant SQL, and comprehensive set of features to meet your data warehousing and analytics needs. Open source, scale out, in-memory application and transactional data grid for demanding, high throughput and low latency workloads. Based on Apache Geode, Pivotal GemFire represents a decade of development and deployment in demanding environments such as financial trading and risk, transportation and price optimization at web scale. Use the complete Pivotal platform for developing and deploying innovative applications. Develop and deploy apps at scale with Pivotal Data Suite. Capture all relevant data with an elastic data infrastructure and perform deep analytics with powerful data science. You need a modern data architecture to score data in real time, while training deep machine learning algorithms on large data sets. Pivotal’s data engineering services can help you adopt a modern data architecture. With Pivotal Data Suite, you can scale out data processing on-premise or in the cloud and ingest data sets for batch and stream processing. Through our Data Science Labs, Pivotal’s data science team can help accelerate skill development and kick-start your ability to deliver immediate value to the business. With Pivotal Data Suite, you can deploy advanced analytics databases and query engines that support data science. The scale-out data warehouses in Pivotal Data Suite support machine learning libraries and perform complex SQL queries at high speed. At Pivotal, we think it’s important to connect your data to people and things through applications that perform well. With the Data Suite you can serve high-speed data insights to high volume, distributed user populations while maintaining data consistency. Pivotal Data Suite includes a real time, scale-out in-memory database for high performance applications.